A new UFO has landed at the Ovniport d'Arès, part 2: meeting the designers! A few weeks ago Invisible Bordeaux reported on the new spaceship which has been installed at the ovniport (UFO landing pad) in Arès, at the northern tip of the Bassin d’Arcachon. I recently caught up with the most excellent gentlemen who designed the stationary flying saucer! 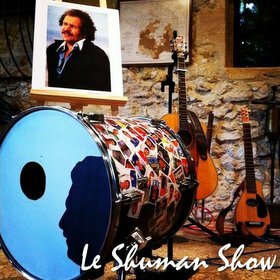 Luc: Claude Richard, the father of Thierry Richard [manager of Sud Ouest Remorques], is behind the project. He got in touch with us on behalf of the town of Arès who were considering restoring the previous spaceship which was in a serious state of disrepair, but so much so that the best option was to start over from scratch. We gave it some thought and we had the idea of basing the design on the spaceship in the movie La Soupe aux Choux, which was therefore more modern than the previous model. Thierry: Luc came up with the initial designs and I was lead on the actual design of the framework, so it basically popped out of my head! Luc: That’s right, I provided sketches and we worked on improvements together and came up with the overall shape. The most difficult aspect was getting the proportions right given size constraints as well as future use by children and grown-ups. We weren’t totally free in the choices we could make. 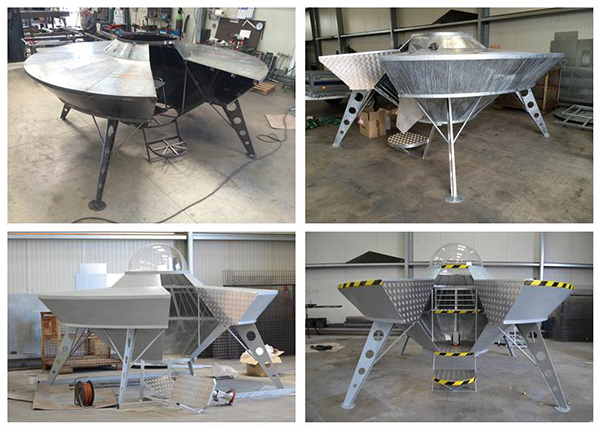 The spaceship as it took shape in the Sud Ouest Remorques workshop. You spent around 400 hours on this project, how did that pan out? Luc: It was very intense, mainly evenings and weekends over a period of several months. 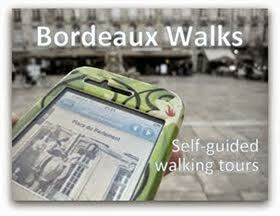 The project was not scheduled in our usual workload so it was mainly during our free time rather than working hours. The unveiling ceremony on June 18th of this year must have been memorable! Luc: We were especially pleased to see Mr Richard who was clearly very moved to witness the completion of the project; it was his initiative and he had been very committed to it taking shape, he was delighted to see the spaceship being installed! 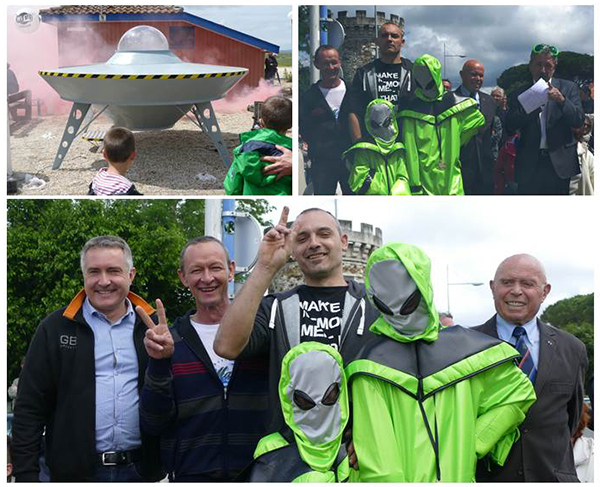 Main picture: Luc and Thierry flanked by Thierry Richard and Claude Richard (and two aliens) at the official unveiling in Arès on June 18th 2016. Top right: Jean-Guy Perrière, the mayor of Arès, mid-speech. Do you have any trade secrets you can share? But this spaceship is made of more durable material than the previous one, isn’t it? Thierry: The framework is raw steel, joined using MIG welding techniques. The interior and exterior surfaces were all galvanized at temperatures of around 300° in La Rochelle, which guarantees around sixty years of protection against corrosion. Special paint was also used, ensuring optimum protection against sea salt-related damage, which is what affected the previous spaceship. The rusty predecessor, now out of harm's way on the Sud Ouest Remorques car park in Saint Jean-d'Illac. So this new spaceship will remain in position until a genuine UFO lands there. Do you believe in extra-terrestrial beings? Luc: I’m looking forward to them coming to meet me, but for now I haven’t seen any form of confirmation! Luc: Everything is in place to welcome them, and I know that many people are seriously looking forward to it happening, we have met some very passionate people. Thank you Luc and Thierry! Et merci à Guillaume qui m'a mis sur la piste de ce beau sujet !